Engine flush - how often is too often? Discussion in 'General Talk' started by boiboi, Feb 1, 2019. Want to get opinion from sifus here - my car is around 80k mileage, never done engine flush before. is it time? How often to do engine flush? Info i get from the Maxx N Go mechanic that regularly service my car is engine flush not recommended for car with mileage below 150k as it is corrosive and can spoil the engine internal. True? What is engine flush by the way? Arent you flushing already whenever you change oil? Whats the different flushing below 150k and above 150k? The chemical still comes into contact with the engine internal. So , the claimed of flushing below 150k km will damage the engine is baseless. Modern engine oil already had cleaning agent so my view is to do oil change on time and used the best engine oil for your usage. Have i tried engine flushing before? Yes, the chemical type.I can confirmed if it had bad effect. I had even used engine oil for diesel engine in my engine. Those supposedly contain stronger/higher cleaning agent. You don’t need it. Just stick to branded full synthetics engine oil and change every 10,000km or 1 year whichever sooner. How I know? My turbo (oil cooled) and engine is clean and beautiful. Changed the head on my engine and there was a leak on the turbo oil feed hose. So dismantled and looked at it. Sometimes I use engine flush but not often, like only once every 40-50k km. I use Gold Eagle brand bought in Ace Hardware. I choose this because it is more like oil as well hence still has lubrication properties, not like those others that looks more like kerosene. Long time back I used Wynn's which also like thin oil but here I don't know where to buy but anyway this Gold Eagle seems good enough too. honestly don't have to if you use good engine oil with frequent change intervals... flushing engine oil is just flushing money down the drain. Well I used to flush using new cheap oil with those engine flush agents. I drain the old oil then fill up new oil plus the engine flush, run it for a few minutes and drain it again. The new oil immediately became dark with dirt. Oh and I do use reputable engine oils all the while. So yeah it does work as expected. Since on sludge issue, this was asked before. Firstly not all sludge can be cleaned off by flush alone. There is also issues like sludge that are dislodge and get stuck inside the fine oil path. What is your take on this? Well, to me the best of all is use FS or SS in the 1st place and change within the stipulated time frame, and you wont have sludge in the first place. This I can attest to with my Proton Saga that I sold back in 2017. If you already have sludge, then I suggest instead of flush, use FS oil but shorten the OCI to 1000km and do it 3 times, for this, the on sale Shell Helix Ultra will do great. As for the leaking after flushing, that could be because the seals themselves have hardened, or the flush composition itself could be corrosive. It becomes way too expensive if have to change FS oil within just 1000km, for 3 times some more. The engine flush I use only costs rm18.50. Honestly no idea because I also never experienced such cases before, even on my old Mitsubishis back then. I guess the way I do maintenance with such occasional flushing is more of a preventive measure. If one 4L bottle for RM90, thats ok, still worth it than taking risk with the flush dislodging and blocking some passages, or the seals leaking. I'd rather use cheap mineral oil plus the rm18.50 flush. 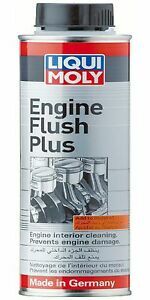 I think modern engines don't suffer sludge issues that much since all specifies FS oils. It was the old Audi that was notorious. Sigh. This topic keeps on popping up every no and then and there are literally thousands of videos on Youtube talking about this. - If from day 1 you've been using mineral / Semi-Syn oils and changing regularly at 7-8k km intervals, you're probably better off not flushing and just sticking with your OCI and choice of oil. If you have sludge it may or may not be clogging up wear and tear bits and pieces like oil seals and gaskets preventing leaks. Flushing will likely flush out that sludge and what previously isn't leaking - will start to leak. - If from day 1 you've been using mineral / semi-syn oils and have been going crazy with the OCI and changing every 2000-3000km (yes I do know people who do this), then you really don't need a flush cuz you wouldn't have given the oil enough time form sludge. Won't matter if you flush too. But this is highly dependent on whether your car is a daily driven one or barely driven one (hence low mileage). If daily then no issue, if barely - better make sure you max give it 6 months and do an oil change even if you haven't touched 2000-3000km. - If from day 1 you've been using fully synthetic oils - then you really don't need an engine flush. Most if not all FS oils have great additive packages and some extremely good detergents built in. Like Royal Purple, guaranteed to clean out any varnish and sludge left behind by your prev oil. A certain rich fella I know uses Royal Purple to flush his engine every oil change before filling his own choice of oil. Unnecessarily excessive. - There are several types of flushes out in the market. Some that bond with the engine oil and suspend the sludge and dirt (like Bluechem products) and still provide certain amount of lubricity meaning the engine can still be driven 100-200km, and then there's some that are supposed to run in your engine for 10-15 mins and drained (not meant to be in the engine too long due to it's acidic nature). I've used a few brands in the market and the best one I've used is the Bluechem one. I say "best" because of the value vs how it's used. In terms of cleanliness all brands seem to be the same. But the CRC one is a little scary - even after draining the oil the smell of the flush is still in the engine. I usually flush the flushed engine with cheap oil to remove any leftover flush if any. Bluechem doesn't need that, if the article is still in ZTH, I wrote a whole article about it and how it works. ^pomen_GTR^ and sweelt like this.